All materials to be excavated is classified into one of the following classes and is paid for at the rate for that particular class of material. No distinction is made whether the material is dry, moist or wet. 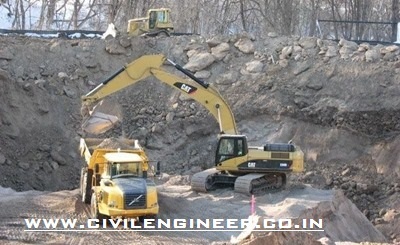 Any earthwork is classified under any of the following categories; in accordance with IS-1200 – part-I. These includes all kinds of soils containing kankar, sand, silt, hard and soft murrum and/or shingle, gravel, clay, loam, peat, ash, shale, etc., which can generally be excavated by spade, pick axes and shovel, and which is not classified under “soft and decomposed” and “hard rock” defined below. This also includes embedded rock, rubble not longer than 500 mm in one direction and not more than 300 mm in the other two directions. Removal of such ordinary soils by mechanical excavators, shovels, draglines etc. is payable at the rate for ‘Ordinary soils’. This includes rock, boulders, slag, chalk, slate, hard mica schist, laterite and all other materials which is rock, but does not need blasting and could be removed with picks, hammer, crow bars, wedges and pneumatic breaking equipment. The mere fact that Contractor resorts to blasting for reasons of his own, does not qualify for classification under ‘hard rock’. This also includes excavation in macadam and tarred roads and pavements. This also includes rock boulders longer than 500 mm in one direction and not more than 500 mm in any one of the other two directions. This includes all rock occurring in large continuous masses, which cannot be removed except by blasting for loosening it. Hardened varieties of rock with or without veins and secondary minerals, which require blasting is considered as hard rock. Boulders of rock occurring in such sizes and not classified under (a) and (b) above is also classified as hard rock. This will also include reinforced cement concrete (reinforcement to be cut through, but not separated from concrete).